LONDON--(BUSINESS WIRE)--Technavio’s latest report on the global self-monitoring blood glucose (SMBG) strips market provides an analysis of the most important trends expected to impact the market outlook from 2017-2021. Technavio defines an emerging trend as a factor that has the potential to significantly impact the market and contribute to its growth or decline. The SMBG test strips market is mainly driven by an increase in the prevalence of diabetes and growing awareness about the importance of disease management. However, owing to the declining average selling price of SMBG test strips, the overall revenue of the market is expected to increase at a moderate rate during the forecast period. The wound healing properties of silk produced in India was discovered in 2014 by the scientists from Advanced Study in Science and Technology. The natural silk was combined with polypropylene to create a product with strong antibacterial properties and to improve wound healing. After extensive research, they found a new use of Indian silk in diabetes management. “The scientists in a laboratory in Bangalore, India, have worked and found a way to weave diabetic strips from silk. The manufacturing of tests strips from silk is easier compared to other material. The test strips made from plastic and paper are coated with enzymes that help glucose in turning to electricity, that can be read by the device having electrodes present in the material,” according to Srinivas. Although diabetes is a chronic condition, it can usually be controlled with medication and a planned lifestyle. To measure the glucose levels in the blood, most people prefer portable medical devices such as BGM (blood glucose monitoring) devices. Blood glucose test strips and blood glucose meters have become a vital part of the healthcare management repertoire of individuals with diabetes. Frequent blood glucose testing is necessary for effective diabetes management. Use of blood glucose test strips and meters at home can help individuals get accurate blood glucose level readings within seconds. This trend is expected to have a strong impact on the BGM Device market and the global SMBG strips market during the forecast period. Vendors are increasing their online marketing activities to improve sales and brand equity. This not only provides customers with easy access but also helps vendors reduce their operational costs. For instance, leading vendors such as Roche Diagnostics and LifeScan provide blood glucose meters, blood glucose strips, and lancets online. 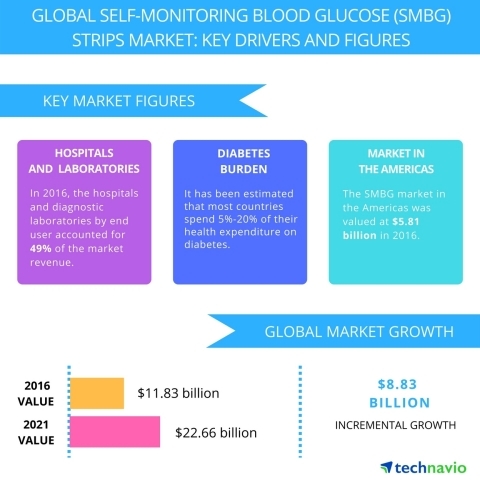 Technavio's latest report on the global self-monitoring blood glucose (SMBG) strips market provides an analysis of the most important trends expected to impact the market outlook from 2017-2021.